The National Referral Directory is available in print and online. 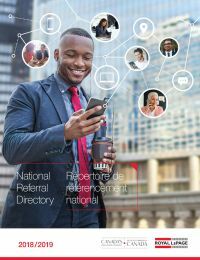 The print copies were shipped to offices across Canada in early September and the digital version allows you to easily access the National Referral Directory from your computer or mobile devices. View the digital National Referral Directory, visit: rlp.ca/referral_directory. Advertising in the directory is a great way to gain exposure to with other Royal LePage professionals. You should be marketing yourself on multiple channels: digital, social media and print, broadening your reach and maximizing all referral opportunities. Your ad would complement your other marketing efforts and ensure you continue to stand out. Royal LePagers can now find you on all platforms! Did you know? When new Royal LePage brokerages join us, a copy of the Referral Directory is sent to each new agent? It’s a great way to get your name and qualifications in front of your new colleagues. Don’t miss out on advertising in the next edition! 1.888.983.5366 ext 427 or by email rlp@teldon.com.